According to the new market research report by IndustryARC titled “Air Curtains and Unit Heaters Market: By Type (Recirculating, Non-Recirculating); By Distribution Channel (Distributors, Contractors and Others); By End User (Commercial, Industrial and Others) and By Country (U.S., Canada) – (2018-2023)”, the market is driven by low capital and installation costs, high reliability and ease of staying in the U.S. and Canada. The southwestern region of the U.S. contributed the largest market share for U.S. Air Curtains Market and is anticipated to reach 149.1 K shipments by 2023 at a CAGR of 7.9%. However, the Mid-Atlantic region contributed the most to U.S. Unit Heaters Market and is expected to reach 50.4 k shipments by 2023 at a CAGR of 13.90%. When it comes to Canada, Central Canada stood first in shipments for both Air Curtains and Unit Heaters Market and is anticipated to make 109.5 k and 78.4 k shipments at a CAGR of 2.7% and 6.3% respectively, by 2023. While the highly diversified technology innovations and world-leading industrial output of the country are the major factors of growth in the U.S., the government encouragement to adopt air curtains by offering financial incentives to businesses that purchase or rent air curtains, resulting in buyer inclination in Canada. The key applications include commercial and industrial, among others. • The market share analysis has been executed for all the air curtains and unit heater providers at both the global and country level. There were different parameters incorporated to understand the outreach of product and service providers. Some of these parameters include a company’s revenue, product & service portfolio, developments specific to air curtains and unit heaters, geographic presence, distributors, sales channel and a few others. • These companies offer a wide range of products and services, tailored to fit the requirements of end users, thereby augmenting their respective positions in the market. • The capability of Air curtains to minimize the infiltration of airborne contaminants in high traffic conditions has driven the National Sanitation Foundation to approve the deployment of air curtains into the food service industry for insect and pest control. 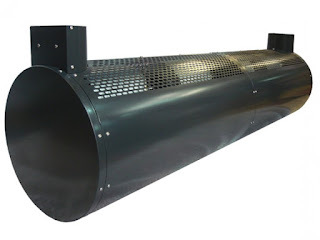 • Unit heaters are required extensively across the country, particularly in cold regions that experience low temperatures as well as in the industrial sector where high-temperature processes are utilized. The commercial unit heaters are used for space heating in warehouses, factories, industrial, retail and other sectors.